She is a Season Two and Three Walker (Zombie) on The Walking Dead. She appeared in episodes one, two, three, twelve and the Finale of Season Two. During that season she led the horde to eat. Otis, and was in the burning barn and many other scenes. As of this email she has been in episodes six and eight (Season Three's mid-season Finale) ten and twelve as one of the zombies in the bread truck. Savana was Chandler Riggs' (Carl) stand in, photo double and stunt double. She was Chandler's photo double during the scene when Shane was shot! She also stood in for Madison Lintz (Sophia) several times and helped her learn to be a zombie in her final scene. 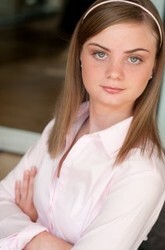 She also played the Governor's daughter, Penny, in the mid-season finale of season three. Recently she was featured one of The Walking Dead Wardrobe Trading Cards - #M31. She is the popsicle eating zombie on the title page of the Atlanta Magazine's article about The Walking Dead - Zombies Are So Hot Right Now. Other projects she has worked on are MTV's Teen Wolf, Vh1's Single Ladies, Necessary Roughness on USA Network, Fox's new series with Kevin Bacon,The Following. The movie The Watch starring Ben Stiller and Vince Vaughn, The Goats starring Val Kilmer and Rada Mitchell. She was featured in the Indie film - Level 7 released winter 2013 and this spring she will be working on Night of the Living Dead: Genesis as a lead Ghoul and Ghoul Coordinator. Most anticipated, she was cast in the Hunger Games sequel: Catching Fire to be released Christmas 2013. Her newest project is a digital game featuring fellow Walkers from the show as well as possible Main Cast members called: WeHunt Zombies. It's a cross platform game that will give the player the choice of being a zombie or a survivor. Since 2006 she has worked at various haunted houses and has continued to work at a haunted attraction every season since. Including being a featured character at Six Flags Over Georgia's Fright Fest for two years. Savana is a full time student at the University of West Georgia where she is a Junior and majoring in Early Childhood Education. But acting is her passion.